Site of a castle built by Edward III in 1361-1377. It was intended for coastal defence and for the defence of the planned town to be built alongside it. It was also equipped as a Royal residence. Unconventional circular plan with 6 rounded towers projecting from an innner curtain wall. Concentric outer wall with defended gatehouse. A forerunner of the defensive coastal forts later built by Henry VIII. Pulled down in 1650. Not open to the public. This fine stronghold, called also the Castle of Sheppey, stood on the W. side of the Isle of Sheppey, near the W. mouth of the Swale river, about two miles southward of Sheerness. A fortress here existed in early days for the guarding of the water passage, but this one was built anew by Edward 111., about 1361, “for the strength of the realm, and for the refuge of the inhabitants of this island.” His architect and superintendent was William of Wykeham who, in spite of difficulties of position and lowness of the site, erected a large, strong and magnificent fortification, suitable for receiving his royal master. When finished the King paid a visit to it, remaining there several days. He made the town a free borough, and named it after his Queen, Philippa, by Royal charter, in 1366. Little use appears to have been made of this castle, which never has figured in military history. It received repairs in the reign of Richard III., and in 1536, when King Henry VIII. was adding to the fortifications of the southern coasts, Queenborough was strengthened ; and again, in the reign of Elizabeth, it was further repaired. And so it continued, constables being regularly appointed to it until the year 1648, when it was seized by the Commonwealth Council, among other possessions of the Crown, and vested in trustees, and a survey was made in 1650. 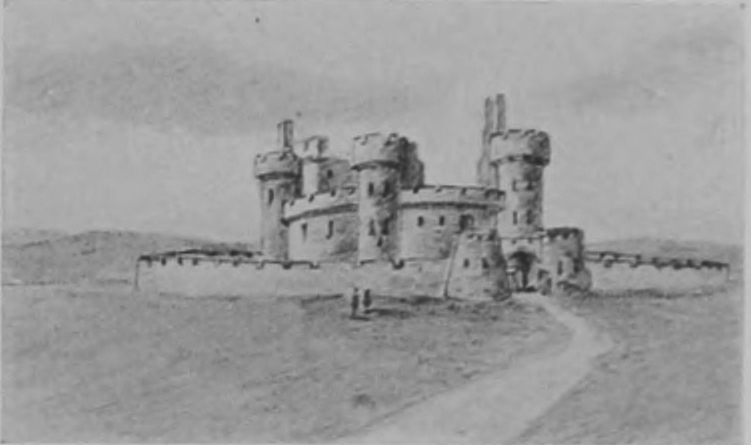 This survey declares the castle to have contained about twelve rooms in the basement and forty on the upper floor ; being circular, and built of stone, with six towers and out-offices, all roofs being lead covered. Within the walls was one small round court paved and in its centre was a large well. The castle had one great court surrounding it, on the outside of which was the moat. The fortress abutted on the high road from Queenborough to Eastchurch, and contained 3 acres, I rood, 11 perches. “All is much out of repair, and no ways defensive by the Commonwealth, being built in the time of bows and arrows.” Therefore, having no command of the sea, or even a platform for guns, it was adjudged unfit to be retained, and to be demolished—the materials being valued at £1792 12s., so it was soon after sold and pulled clown. The site reverted to the Crown at the Restoration, and it so remains. Nothing whatever exists of the structure at the present day except the moat and the ancient well, which is 200 feet deep and is lined with Portland stone ; it was reopened and cleaned out in 1723 for the use of the Navy. On the list of constables of this castle appear the names of John of Gaunt, in 50 Edward III. ; Robert de Vere, Earl of Oxford, attainted II Richard H. ; Thomas Arundel, Archbishop of Canterbury (10 Henry IV.) ; Humphrey Stafford, Duke of Buckingham (28 Henry VI.) ; George, Duke of Clarence (1 Edward IV. ); the last being Philip, Earl of Pembroke and Montgomery (temp. James I. ).